The Piggins Motor Truck Company sales brochure explains the idea behind the axles only tersely: "The square member carries the weight and the pumpkin axle furnishes the power to the large steel hardened gears on each rear wheel." The central mechanical challenge had been to protect the power-shafts from being bent when the roadwheels lurched. Charles Piggins's inspiration was to mesh drive-pinions to the outside of spur-gears (wheels with teeth cut in the rims parallel to the wheel's axis) which were integrated on the road-wheel hubs. 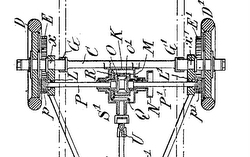 The driving pinions were on the ends of the left and right jack-shafts. Even if the axle were to flick up or down a few milliseconds before the motion reached the jack-shaft, these gears would remain firmly meshed. Backward-and-forward motion of the rear axle could also be accommodated, with the propellor shaft able to elongate and shorten itself by splines inside a sleeve in the two-part propellor shaft leading from the engine to the differential. The distribution of the driving strain between the differential mechanism and the final drive gearing associated with the traction wheels. This distribution ... makes a smaller differential practical (George R. Walker, patent 1420793). 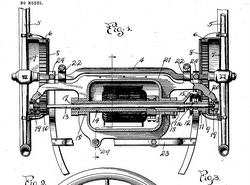 Piggins's own explanation in US Patent 1117700 of why he invented the spur-gear drive focusses simply on the freedom of movement of his construction: he aimed "to provide a rear axle having the driving wheels loosely mounted thereon and a yielding connection between the vehicle frame and the rear axle..." He added: "The rear axle may move toward and away from the vehicle frame as permitted by the springs without interfering with the driving connection." In 1912 he sought a patent for this design. The drawings show a load-bearing axle which was simply a solid bar, probably tempered steel with a square cross-section of about 8 or 9 centimetres, bound to the leaf springs. 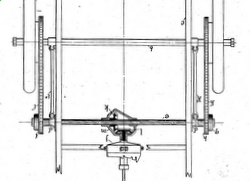 Forward of it was a drive assembly (T-shaped when viewed from above or below) comprising the main transmission and the tranverse drive-shafts. The Reliance truck, described by Kimes as successor to the Practical Piggins, used a "Badger" spur-gear back axle of very similar design to the Piggins axle. 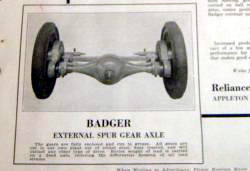 Why it was described in advertisements as "Badger" in type is not clear: it may have been Reliance's own brand-name, based on the sobriquet for Wisconsin, "The Badger State", or it may have been a brand still used by the Four Wheel Drive Auto Co. of Clintonville, WI, a few miles from Appleton. The FWD company still exists. It had been known as "Badger FWD" until about 1910. This page is a work in progress and will never be quite finished. If you have a comment or a contribution, please write to me. This page is licensed under a Creative Commons Attribution-No Derivative Works 3.0 Unported License.